For many people it is useful if open the most recently used document automatically opens when they launch MS-Word. It’s easy enough to do, let’s see how. Many people look for a facility in Microsoft Word that could open the last used document automatically. That is to say, when you open MS-Word, the most recently used document should also open on its own. This helps those folks who open and close a document quite often. Press enter and MS-Word will open with the most recently opened document. This command has two parts. 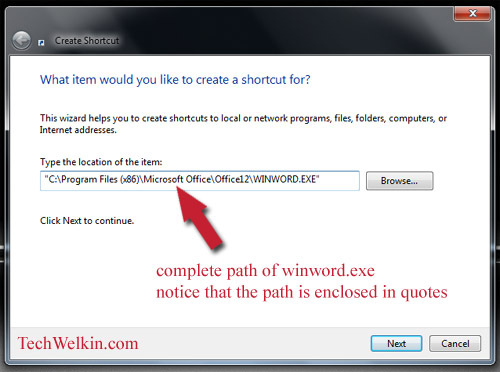 The first part (winword.exe) launches MS Word and the second part ( /mFile1 ) opens the last opened document. NOTE: In Windows XP use, Start > Run and then type the above command. The command explained in previous section works fine but it would be much easier to use if you create a shortcut for it. Go to Desktop and take right click on any empty area. Select New > Shortcut option. A box will pop-up and it will ask you to browse or type the location of the file to be opened. In this case we want to open winword.exe (this is the file that launches MS-Word). Click on Browse button and go to the location where this file is located. Once you find it, select this file and click OK button. Usually this file is located in C:\Program Files\Microsoft Office folder. Location of the selected file in double quotes. Click Next button, give this new shortcut a name and you’re done. A new shortcut will be created on your computer’s desktop. Double click it to open MS-Word and the most recent document in one go. Please don’t forget to let me know how you liked this article! Also, if you have any problem –do comment and I will try to help you out. This helped me a lot. Thanks, it was just what I was looking for. I am glad, Stefan, that the article proved to be useful for you. Stay connected with TechWelkin for more tips!